So a little explanation on this one first. What is "Cinematic Titanic?" 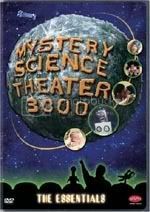 It is a DVD series in the vein of Mystery Science Theater 3000 with a cast that is comprised of MST3k alums including original host Joel Hodgson. It isn't exactly like MST3k though, CT puts more focus on the actual movie, they don't break into it with skits etc..(though they do pause the movie on occasion for some silhouetted shenanigans). 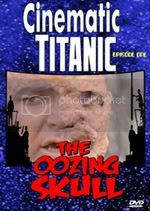 Ok then so what about "The Oozing Skull." what is that? 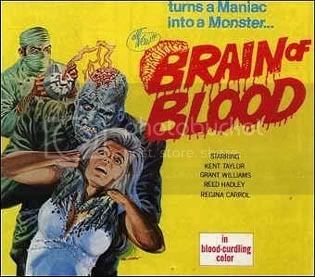 It's a horror flick from the 70's that was originally titled "Brain of Blood." Part of the deal that CT made when acquiring the rights was that they should re title the movie so as not to confuse merchandising. "Brain of Blood" is the type of movie that on it's own I could definitely see myself sitting down and watching (MST3K had a few of them as well, most notably "This Island Earth" from MST3K: The Movie). Extremely brief overview of "The Oozing Skull/Brain of Blood"
The leader of Kalid, Amir, is dying. This is bad. But there is a chance for him by way of an experimental, and scoffed at by the medical community, brain transplant. As per usual that doesn't go exactly as planned. Instead of a normal healthy body Dr. Trenton must place Amir's brain into that of the Doctor's large deformed assistant. Amir's new body has unplanned and violent side effects on Amir's mind. On top of that Dr. Trenton has his own nefarious plans. Throw in an angry violent dwarf assistant, and a chained up woman in the basement and that about covers what you should expect! So yeah the film on it's own is pretty awesome. Now the "Cinematic Titanic" elements. This is where I may upset some people. Before I start I'll say that I Love the concept and I really really want the franchise to succeed. That being said I didn't love the experience as much as I had hoped. I did enjoy it. Funny people getting together and talking funny about questionable movies, just a fun concept. The crew is great and clearly comfortable with this style of comedy. As per usual with this kind of fare not every joke told will be a winner. But those that work do so extremely well. I'll admit that the Minnesotan accent killed me every time (which to be fair is the norm for me. Even when it is just family speaking with it.). Some of the jokes just came off a bit too contrived and practiced. Also the pace of them was at times just a little much. Take a breather guys! The silhouetted look was reminiscent of MST3K though slightly tweaked. I didn't mind that, and the movement was nice. I wasn't so much a fan of the crane jokes that really slowed things down. The biggest thing I think was that it just seemed like a stream of one liners in rapid succession as opposed to a running commentary. What we have here in essence, nitpicking aside, is a few things. It's an interesting concept, a nostalgia inducing good time, an entertaining movie, and above all else a great start! If you were to ask me my opinion on if you should pick this up or not I'd have no trouble telling you to run to the site and order yourself a copy. Small bumps aside it is a fun time. Also remember supporting this movie helps ensure the future of the series and the future potential here as I see it is huge!